Mortgage markets worsened last week in see-saw trading. By the time Friday’s market closed, mortgage rates were higher across the board — ARMs, fixed rates, FHA and conventional. The biggest stories of last week were actually non-stories. First, the ash cloud from Iceland’s Eyjafjallajökull volcano dissipated, allowing warehouses to move inventory, airlines to move people, and businesses to move product. In addition, Greece moved closer to securing emergency funding that will help it stave off default. When these two issues were threats earlier in the month, mortgage bonds rallied on safe haven buying, driving rates down. 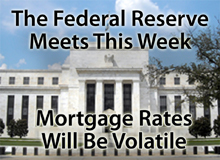 As the threats lessened over the course of last week, however, mortgage bonds sold off and mortgage rates rose. By contrast, this week features lots of stories. Economic data will be at the forefront, as will the Federal Reserve which meets for one of its 8 scheduled meetings of the year. Furthermore, Wall Street will have its eye on the Senate’s questioning of key Goldman Sachs employees in the wake of the SEC’s fraud charge. In general, news that’s “good” for the U.S. economy will be bad for mortgage rates, and vice verse. And with mortgage rates changing as quickly as they have been, rates could really rise in a hurry. The best defense against rising mortgage rates is to execute a rate lock. If you’re nervous about rates moving higher, call your loan officer and execute your rate lock today. Mortgage markets improved last week to the delight of rate shoppers. Against a sparse economic calendar, Wall Street turned its attention to geopolitics in Greece and the Eurozone. It didn’t like what it saw. Safe haven buying buoyed mortgage bond markets last week as pricing recaptured two-thirds of its monumental losses from the week prior. 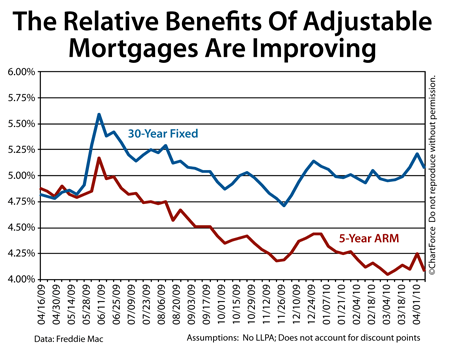 Despite last week’s surge, however, conforming and FHA mortgage rates remain near their worst levels of the year and appear poised to increase throughout the summer months. Furthermore, continuing jobless claims were down again. Good news for the economy is generally bad news for mortgage rates. Last week, that wasn’t the case because of Wall Street’s want for “safe” assets right now. 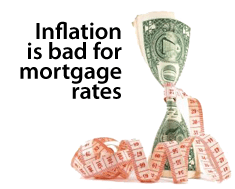 This includes mortgage bonds and is helping to keep consumer rates low. When the safe haven buying eases, rates should climb. Meanwhile, this week, the calendar is back-heavy. There’s no real data until Wednesday’s Consumer Price Index, and then there’s a flurry of new releases through Friday’s market close including Retail Sales, Consumer Confidence and Housing Starts. Strength in these issues should push mortgage rates back up. If you’re floating or shopping a loan right now, be wary of market volatility. Rates have been jumpy since April 1 and mortgage rates are changing quickly. This week, locking in before Wednesday may be your safest, near-term rate locking strategy. Mortgage markets performed terribly last week as losses piled up day by day. It marked the second straight week of sell-offs. Pricing was influenced on several fronts including better-than-expected economic data, the end of the Federal Reserve’s mortgage buyback program, and a short trading week. Mortgage rates rose to their highest levels since late-December last week. The data from the most anticipated story from last week — the jobs report — included a few good-for-the-economy surprises. In general, what’s good for the economy is bad for mortgage rates and that’s one reason why rates spiked Friday. 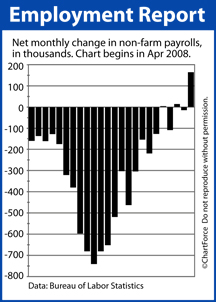 Employment is a keystone in the economic recovery and mortgage markets reacted accordingly. This week is short on data but there’s a lot to move the markets. For one, the Federal Reserve has called an emergency meeting to review its Discount Rate policy. The meeting is called for today, Monday April 5, at 11:30 AM ET. It’s unknown exactly what the meeting will cover, but if new monetary policy is made, expect that mortgage rates will be influenced. Also worth watching this week are the technical trading patterns present in the mortgage-backed bond market. Unlike fundamental trading in which markets move on data and projections, technical trading is how markets move based on patterns over time. The two methods co-exist on Wall Street but, occasionally, technical forces can be pronounced, leading markets to lurch up or down. This week may be one of those times. Mortgage pricing is far below its 200-day moving average, resting slightly north of a key support level. If pricing worsens this week and bonds fall below the support level, mortgage rates could easily tack on quarter-percents or more per day until the market refinds its balance. Overall, it’s a week you don’t want your rate to be floating. 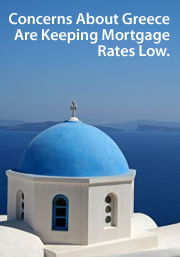 Sure, rates could improve, but there’s a lot more room for them to worsen. 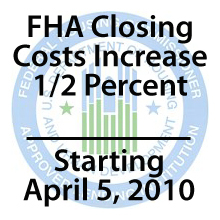 Starting Monday, April 5, 2010, getting an FHA mortgage will be more expensive for borrowers. Mortgage markets closed unchanged last week, but that’s not say mortgage rates were calm. Monday through Wednesday, rates improved steadily before a swift, late-week sell-off unwound the gains. Mortgage rates have been very low for a very long time — against the expectations of most market experts. The speed of the Thursday-Friday reversal may signal that markets are preparing for change. One key story from last week was the Federal Open Market Committee’s scheduled Tuesday meeting. 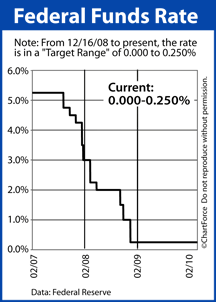 Upon adjournment, the Fed voted 9-1 to hold the Fed Funds rate in its current target range near 0.000% and reiterated its plan to keep rates low for “an extended period of time”. Kansas Fed President Thomas Hoenig was the lone dissenting vote. For rate shoppers , take note. The Fed specifically mentioned that the its $1.25 trillion mortgage buyback program will end, as planned, March 31, 2010. This could force rates higher over the next two weeks because, according to the Fed, the existence of a buyback program forced rates lower by 1 percentage point in 2009. When the program ends, it’s expected that markets will give back some of that 1 percent, leading to higher mortgage rates for conventional and FHA borrowers. Strength in any — or all three — of these reports should put pressure on mortgage rates to rise. But there’s one wildcard this week and that’s the aforementioned Kansas Fed President Hoenig’s scheduled speech Wednesday morning. Typically, Fed members stay on message when making public appearances, but Hoenig is expected to talk about why rates should be higher, and what the Fed needs to do to prepare the economy for late-2010 and beyond. His words could lead Wall Street to rethink its position on the mortgage bond market and that could cause rates to spike Wednesday afternoon. Mortgage rates remain volatile and are still relatively low. If you’re unsure of whether now is a good time to lock in, consider that there’s a lot more room for rates to rise than to fall right now. Especially with momentum shifting for the worse. Homes are more affordable across the nation as the housing market emerges from a slow winter season with mortgage rates still near 5 percent. Soft housing and low rates are an excellent combination for home buyers but whereas home values rise with a gradual pace, mortgage rates change in an instant. It’s something worth watching. 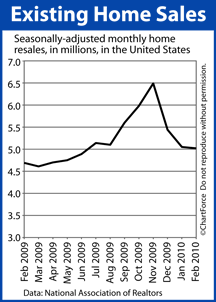 Each 0.25% increase to conventional or FHA rates adds approximately $16 per month for each $100,000 borrowed. Mortgage rate volatility can change your household budget. If you’re trying to gauge whether rates will be rising or falling, one keyword for which to listen is “inflation”. Mortgage rates are highly responsive to inflation. By definition, inflation is when a currency loses its value; when what used to cost $2.00 now costs $2.15. As consumers, we perceive inflation as goods becoming more expensive. However, it’s not that goods are more expensive, per se. It’s that the dollars used to buy them are worth less. This is a big deal to mortgage rates because mortgage bonds are denominated, bought, and sold in U.S. dollars. As the dollar loses value to inflation, therefore, so does the value of every mortgage bond in existence. When bonds lose their value, investors don’t want them and bond prices fall. Mortgage rates move opposite of bond prices. In today’s market, the relationship between inflation and mortgage rates is helping home buyers. The Cost of Living made its smallest annual gain in 6 years last month and the Fed has repeatedly said that inflation will stay low for some time. The combination is driving investors to buy mortgage bonds which, in turn, suppresses rates. So long as it lasts, the cost of homeownership will remain relatively low. Combined with the expiring tax credit, the timing to buy a home may be as good as it gets. A year into the Home Affordable Modification Program (HAMP), servicers converted 170,207 permanent modifications through February, up from 116,297 in January, according to the US Treasury Department. The Treasury launched HAMP in March 2009 to provide capped incentives to servicers for the modification of loans on the verge of foreclosure. To address critics that claim HAMP isn’t having the effect of reaching its target 3m to 4m borrowers, a House Committee on Oversight and Government Reform in February began an investigation of HAMP on concerns of the “effectiveness and efficiency” of the program. According to the latest Troubled Asset Relief Program (TARP) transaction report, the 113 participating servicers under HAMP can earn a total cap of $36.9bn. The Treasury has slated $75bn for the program. Borrowers in HAMP received a median savings of $518 a month, or 36% of the payment before the modification. More than 91,843 active trial modifications need only a borrower signature to become permanent, totaling more than 260,00 permanent modifications approved by servicers. More than 835,000 three-month trial modifications began through February. Active modifications – both trials and permanent modifications – totaled more than 1m. Wells Fargo (WFC: 30.28 0.00%) completed 24,975 permanent modifications, leading all servicers again. Wells had 17,652 permanent modifications in January. In February, Wells had active modifications on 37% of its 379,357 HAMP-eligible loans, up from 38% in January. Bank of America (BAC: 17.03 0.00%) provided 20,666 permanent modifications through February, the second-highest volume of all servicers and an increase from 12,761 in January. In November, BofA had 98 permanent modifications. BofA has active modifications on 24% of the more than 1m mortgages in its HAMP-eligible portfolio in February, up from 22% in January. JPMorgan Chase (JPM: 43.24 0.00%) had the third most permanent modifications at 19,385 through February, up from 11,581 in January. In February, JPM had active modifications on 39% of the 437,323 loans in its HAMP-eligible portfolio, up from 38% in January. CitiMortgage, a subsidiary of Citigroup (C: 4.05 0.00%), provided 15,607 permanent modifications through February, taking its place as the fourth-largest servicer in terms of volume, up from 10,929 in January when it ranked fifth. It has 52% of its 249,901 HAMP-eligible loans in active modifications. GMAC provided 14,675 permanent modifications, dropping to the fifth highest of any servicer, from January when it was the fourth-highest with 11,494 permanent modifications. GMAC has 66,289 loans in its HAMP-eligible portfolio and started active modifications on 53% of them, the highest of any servicer and up from 50% in January. To qualify for HAMP, a mortgage must have a current unpaid principal balance of less than $729,750 be occupied by the owner and originated prior to Jan. 1, 2009. Qualifying borrowers must be employed. More than 57% of the borrowers who received permanent modifications claimed a loss of income as the predominant reason for hardship, the same percentage in January. More than 10% claimed excessive obligation, and 2% claimed illness of the principal borrower. Despite the increases in permanent modifications from 31,382 in November, when the Treasury began reporting that statistic, officials admit the program is not for every borrower. Seth Wheeler, senior adviser to the Treasury when speaking at the American Securitization Forum (ASF) in Washington, DC, said the Treasury is adjusting its focus away from modifications as HAMP is not always the best solution. ALL the lenders above, and most of the Country’s larger lenders are gearing up to implement the new HAFA program, mentioned above, which promises to provide improvements in short sales, in both speed to process, and in the number of short sales that become successful. If YOU have a mortgage hardship now, or one on the horizon, NOW is a great time to seek assistance. For more information on either a loan modification or a short sale, just give me a call, or shoot me an email.